The swimmers and kayakers of Oregon are no strangers to algae. In recent years, warnings of infestations in ponds and lakes have become routine. When an early-summer algal bloom developed on Detroit Lake near Salem this May, state and city officials knew exactly what tests to run and advisories to issue. But city leaders hadn’t anticipated a threat to drinking water. Detroit Lake drains into the North Santiam River, and from there, water runs into the municipal system. On May 31, a few days after the algae was first detected in the system, Salem toxicologists found potentially deadly toxins in the water supply. That same day, the city warned its nearly 200,000 residents that tap water was off-­limits for children under the age of 6, people with existing liver or kidney conditions, pregnant and nursing women, the elderly and pets. The advisory remained in place for more than a month. It was the first time Oregon had detected algal toxins in treated water. “This was a real wake-up call for us, that, yeah, it can get into drinking water systems,” says Jonathan Modie, a communications officer for the Oregon Health Authority. Because of the lack of data, experts don’t know for certain whether toxic algae outbreaks are increasing in frequency or simply being reported more often. But warmer temperatures do encourage the growth of algae and algal blooms, and that can come with a potentially deadly threat. Most algae are harmless, but certain species of the blue-green variety, also called cyanobacteria, produce toxins strong enough to poison large mammals, including humans, with potentially fatal consequences. In 2001, the EPA and the Water Research Foundation surveyed 45 drinking water sources in the U.S. and Canada. Four in five, they found, were contaminated with microcystin, which attacks the liver and kidneys. Although most people make full recoveries, life can become pretty unpleasant, and the symptoms—fever, nausea and diarrhea—can be confused with food poisoning. One expert estimates that more than 90 percent of lakes, rivers and reservoirs used as drinking water sources in the United States are vulnerable to algal blooms. Equally troubling: The majority of water treatment plants aren’t equipped to remove toxins, which require pricey treatment methods like ozone disinfection. When the algae interfere with drinking supplies, timely remedies can be hard to come by, leaving some towns with no choice but to order the residents to stop using tap water, sometimes for weeks at a time. Although municipal water managers are reluctant to talk publicly about the issue, “they’re very worried,” says Deepak Mishra, an associate professor of geography at the University of Georgia who studies the global distribution of harmful algal blooms. 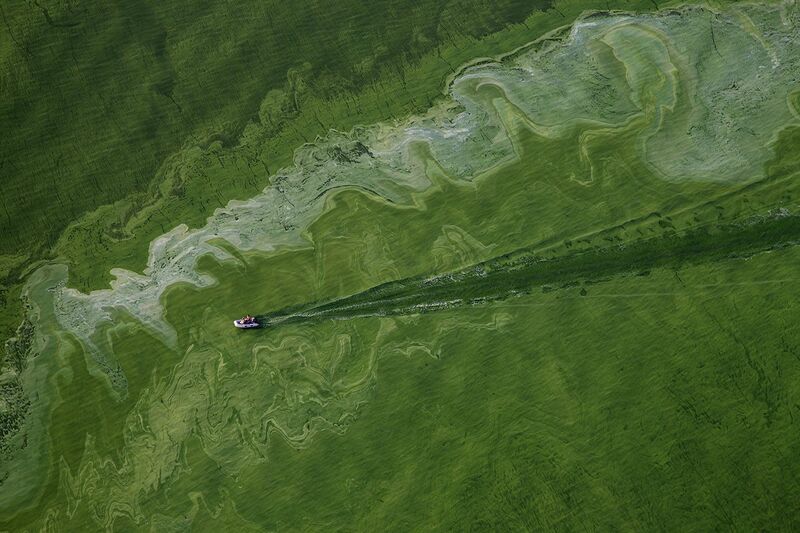 So far, nobody has died from algal toxins in the U.S., but the possibility looms. A high enough dose of microcystin could cause liver or kidney failure, says David Farrer, a public health toxicologist with the Oregon Health Authority. A combination of microcystin and cylindrospermopsin, another potentially deadly toxin, is thought to have killed 52 people in Brazil in 1996, though they were dialysis patients who suffered intravenous exposure to contaminated tap water during treatment. Comprehensive data on algae contamination in the U.S. is lacking, largely because municipalities are not required to test for it. Some states and townships began testing a decade or so ago, but the benchmarks water administrators use to determine if the water is safe to drink are largely preliminary—the Environmental Protection Agency implemented its first trial protocol just this year. Norton, Kansas, had an algae scare on June 19. Pond scum on Sebelius Lake, a reservoir, contaminated a treatment plant with a specific kind of cyanobacteria known to produce anatoxin, which targets the brain and can cause seizures, loss of muscle control and even death. 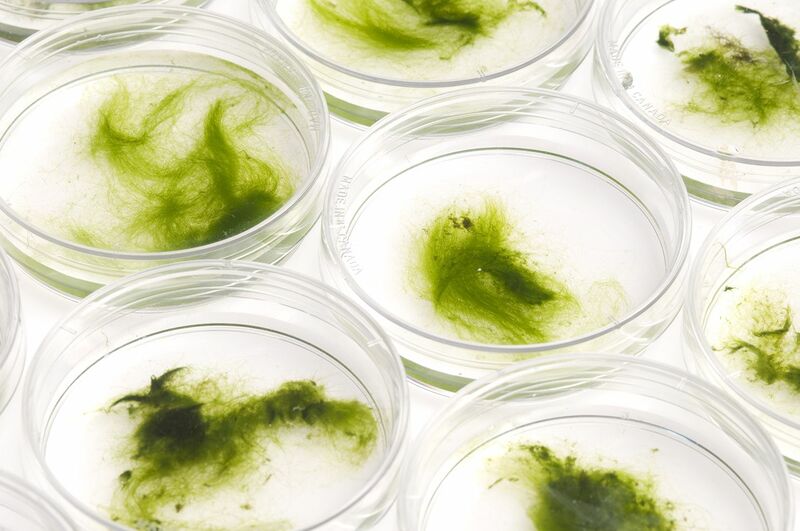 When lab results confirmed the species of the algae, the response was swift. The town of Norton immediately stopped drawing water from the reservoir, and the Kansas National Guard arrived hours later to hand out bottled water. Shutting down the reservoir strained the rest of the water system, and when it failed, health officials ordered roughly 3,000 residents to boil their water before drinking it. Officials later confirmed no toxins had entered the public supply. Boiling water, however, isn’t a solution. Filters will catch the algae themselves—blooms are prone to causing problems by physically blocking filters—but the toxins flow through. And chemical disinfectants like chlorine, which kill algae, can actually make the problem worse, because cyanobacteria release intense bursts of toxins when they die. “There’s really not a lot that you can do,” says Farrer. Greenfield, Iowa, experienced a similar scare in mid-July when potentially harmful algae from a bloom on Greenfield Lake managed to slip through a filter in the town water treatment plant. Greenfield Municipal Utilities ordered its 12,000 customers to avoid their tap water until lab results determined whether toxins were indeed present; tests eventually revealed they were not. But toxins don’t have to enter the water system to cause disruption. In Utah in 2016, a massive algal bloom on Utah Lake tainted the water that residents in three counties use as untreated “secondary water” for their lawns and gardens. Officials were unable to determine if food grown with the contaminated water was safe to eat. As the algae spread, one secondary system after another opted to exercise an abundance of caution and close its valves. Residents switched to watering their lawns with drinking water, causing citywide shortages. Algal toxins in drinking water is not a rare event, Mishra says. “They’re always there,” he says. “It’s just that a lot of them go undetected.” The question is whether low-level consumption is harmful. Mishra suspects that if the exposure is long-term, there could be cumulative damage to the liver and brain. Unfortunately, with research focused on trying to understand how, and when, these toxins kill, there are few studies on public health consequences. The lack of good treatment options has led the Water Research Foundation to recommend a multistage approach combining several methods of decontamination. That could require treatment plant renovations that run into the millions of dollars. Many states are taking aim at the algal blooms themselves, attempting to starve the cyanobacteria by reducing nutrients like nitrogen and phosphorus, present in fertilizers and discharge from sewage plants. Kansas has an annual budget of over $5 million dedicated to limiting the amount of fertilizer and wastewater in waterways used as drinking water sources. But Oregon isn’t taking any chances; cities in the state are already investing in expensive new treatment plants. “This appears to be a new normal for us,” says Modie.